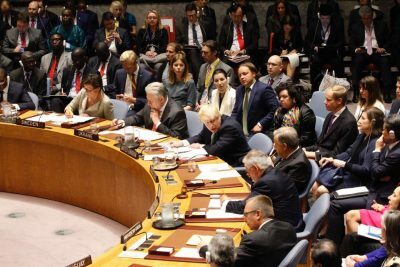 As reported by CNN, “The United Nations Security Council on Saturday [5 August 2017] passed a resolution imposing new sanctions on North Korea for its continued intercontinental ballistic missile (ICBM) testing and violations of UN resolutions. With 15 votes in favor, Resolution 2371 was passed unanimously. Resolution 2371 was imposed – by whom else? – the United States of America, the chief aggressor of the universe; the exceptional rogue nation that is never punished, never sanctioned by the very Peace Body, the UN Security Council (UNSC), for the millions of war deaths and drone murders caused by illicit and hegemonic wars, by proxies or by its own killing machine around the globe within the last 70 years – or more. This anti-DPRK Resolution was unanimously approved by all 15 members of the UNSC, including North Korea’s only allies, China and Russia. They may have had their own strategic and selfish reasons for their lack of solidarity, for not vetoing the Resolution and instead proposing diplomatic measures – or else. Diplomatic measures which might have called to reason Washington and the Pentagon hawks, as well as stopped Trump’s monstrous warmongering, shouting nuclear threats from his golf club in Bedminster, N.J., “They will be met with fire and fury like the world has never seen.” Russia and China could have proposed a counter Resolution seeking dialogue and forcing Washington to stop its belligerence. – They didn’t. And that’s sad. It is an outright shame to what extent literally the entire world is bending over backwards to please Washington – and, as always, its dark and deep state handlers that pull the strings on the White House puppets. Have we become a world of vassals to a dying empire? The same military aggressors led by Washington, more than 60 years ago have destroyed North Korea to rubble, decimating its then population of 10 million by a third. The US has never allowed the signing of a Peace Agreement. Instead the Democratic People’s Republic of Korea (DPRK) under a shaky armistice pact was and is permanently threatened by Washington’s huge military bases in South Korea and Japan with fleets of war planes and vessels. The DPRK’s airspace is frequently invaded by US bombers; military maneuvers by the US armed forces with Japan and South Korea are repeated intimidations on the peaceful lives of the North Korean people. A 250 km long strictly enforced Military Demarcation Line at the 38thparallel north is keeping Korean families separated for more than three generation. What the Kim-Jong-un regime is showing the world is nothing more than its readiness to defend the DPRK’s achievements of a marvelously rebuilt country with full social benefits of free education and health services for more than 25 million people. The nuclear deterrent is no danger to anyone, not Japan, not its Southern brother, and least the United States. And Trump knows damn well. His ‘fire and fury’ boasting is nothing more than sabre rattling, showmanship, as it pertains to a golfing multi-billionaire psychopath, who is dreaming of running a thanks-goodness faltering empire. He wouldn’t dare touching North Korea, because then, he would face the fire and fury of DPRK’s allies, Russia and China, despite their unfortunate UNSC vote. The UN sanctions, if observed, would reduce North Korea’s annual export earnings by a third, i.e. by an estimated US$ 1 billion. It might plunge the country, already isolated by the west’s previous sanctions into extreme hardship and famine. Although it is unlikely that China, with whom North Korea deals for 90% of its external trade, would adhere to such sanctions, it is nevertheless an unfair threat. Let’s look for a moment at the legality of the UN Sanctions Resolution in a broader context – in a context that the world’s populace has either never known or easily forgets. Chapter VII of the United Nations Charter addresses Actions with Respect to Threats to the Peace, Breaches of the Peace, and Acts of Aggression. Bilaterally imposed economic sanctions, the main staple of the United States slapped around the globe at will and at any nation that doesn’t lick her boots, are totally illegal and in breach of any international law. The legality of UN imposed economic sanctions is highly questionable in most cases, and particularly in the case of North Korea, as they may affect Human Rights, or more specifically the civilian’s economic, social and cultural rights (ESCR), as adverse collateral effects may lead to a humanitarian emergency, i.e. the shortage of certain goods and services essential for the guarantee of basic standards of living (Gebs, Robin. “Humanitarian Safeguards in Economic Sanctions Regimes: A Call for Automatic Suspension Clauses, Periodic Monitoring, and Follow-Up Assessment of Long-Term Effects”. The Harvard Human Rights Journal 18 (2005), p. 173). In the case of North Korea, such sanctions are outright farcical, if not illegal, since the main aggressor is not and has never been the DPRK, but the United States. It would, however, never occur to any nation on this lovely planet to introduce a sanctions regime on the US of A through the foremost Peace and Security body of the United Nations. – And why not? – Because they are all afraid of US retaliations. Though, Russia and China and the block of the Shanghai Cooperation Organization (SCO) that already comprises half of the world’s population and controls one third of the globes economic output – and is clearly in the process of fully detaching themselves from the US-dollar hegemony – they should no longer fear retaliations – should they? It is mind-boggling, how the world, the league of nation as it were, has been brainwashed to the core accepting almost without exceptions and questions Washington’s atrocities, crimes on humanity, indiscriminate killings of tens of millions of people around the world, the most vicious human rights abuse recent history has ever known, without blinking an eye. At the same time, this ‘solidary’ league of nations is ready to strangle a small brave nation, North Korea, that is merely testing its capacity of self-defense facing constant illegal threats from the world’s aggressor in-chief, the United States of America. Featured image is from gov.uk.